Inmates at a young offender's institution threw their excrement outside cell windows because of poor sanitation, a report says. Chief Inspector of Prisons Ann Owers said she witnessed "slopping out" at the 530-inmate Portland Young Offenders' Institution in Dorset. Evidence of racial tension and "considerable distrust" between Muslim inmates and staff was also uncovered. 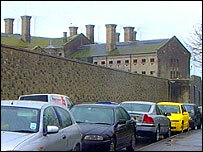 The Prison Service said problems at Portland were being addressed. Ms Owers said: "We observed at morning unlock what could only be described as 'slopping out', with prisoners emptying buckets of urine from their cells. "Outside Hardy unit there were parcels of excrement and bottles full of urine thrown out of the cell windows." She said black and minority ethnic prisoners perceived they were less well treated than white inmates. "Our examination of some of the prison's records did not support this: but the prison's own ethnic monitoring systems were not robust enough to rebut these beliefs. "There was an evident gulf and considerable distrust between the growing Muslim population and staff and managers." Juliet Lyon, of the Prison Reform Trust, said the centre should be closed down. "When will the government realise that incarcerating vulnerable young men in a crumbling island fortress, swathed in mist for most of the year, with almost no purposeful activity or exercise and scant staff attention, belongs to another era. "The best thing that could be done with a prison like Portland would be to turn it into a heritage site which people could visit and marvel that children and young people were ever held in such conditions." The practice of slopping out officially ended in English and Welsh prisons in 1996. Liberal Democrat home affairs spokesman Mark Oaten said: "Dirty, unsafe, oppressive prison conditions have no place in 21st Century Britain." Phil Weatley, director general of the Prison Service, said: "The Prison Service recognises there have been significant problems at Portland for some time but progress is being made in a number of key areas."